The question is dead simple. What are Android-independent questions? If that's a broad thing to answer, then alternatively, how do I identify that a question is Android-independent? The phrase "I know it when I see it" is a colloquial expression by which a speaker attempts to categorize an observable fact or event, although the category is subjective or lacks clearly defined parameters. I get the point that some of the apps are cross-platform but as long as the author is using them on the Android, they should be treated as on-topic. Some Android-independent questions are too easy or takes moderate efforts to identify, but the ones dealing with apps are hard for me to judge. 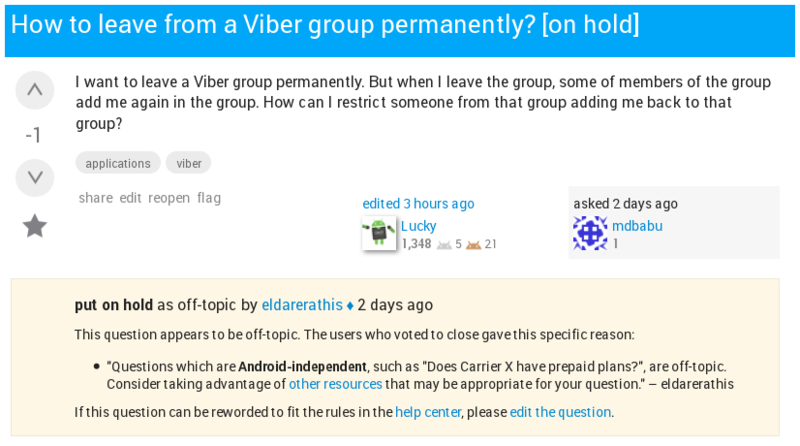 Can I know why those questions dealing with apps like the ones I linked get to be closed as off-topic (Android-independent)? It's not like I can continue to skip the questions for eternity! An Android-Independant issue springs from outside the core operating system. i.e. an issue that originates from a source external to the device/OS and not an "in house" function . Which is hard to peg the difference sometimes. Hi i installed gapps and when i run/start play it force closes immediately. HELP!!! You are likely running the wrong gapps version. there is a difference between Android 5.0.X and 5.1.X. Check which Android version you actually have and then what version of GApps you should be running. Hi, I am running Android 5.1 stock on a Flexus 42, after update the Stock Browser is hanging on pages at random. I've checked out my wifi setup and everything is square, what am I missing. If by update you mean that you jumped API levels, meaning from 4.4 to 5.X, then it's likely you have some incompatible data remnants in /sdcard/Android/data that may be causing problems. Reboot to recovery [if custom installed] and perform a factory reset to clear out that data. You need to do that when jumping API levels whether up or down, meaning from JB-->KK or from LP-->JB and so on. Yup, that did it! =) I installed FLRP Recovery. I didn't know about that. Thanks. yeah, i'm running game snoozle 3.5 on kitkat and when i ttry to log-in it say please update to game snoozle 3.5.3/4's but i don't wanna so how can i trick the server or hack to app to say it's that version? While it is an app running on Android the "problem" originates from an external source and not the OS itself. The same with the app-hacking question. While the question is about an Android app, the problem is with a 3rd party app and not an app that is part of the core system. I cross-compiled the tar compression utility through my debian chroot on my tab so i can use it in Android natively. I work with some very large archives and when trying to compress an archive larger than 1.5 gb i get this crazy output in terminal and my device hangs and i have to reboot. When my device is back on line instead of the archive i was trying to create has some wierd name instead $$@$*??? and now i can't delete it, no such file. Any ideas? Result feel bad for the user but VTC as OT. 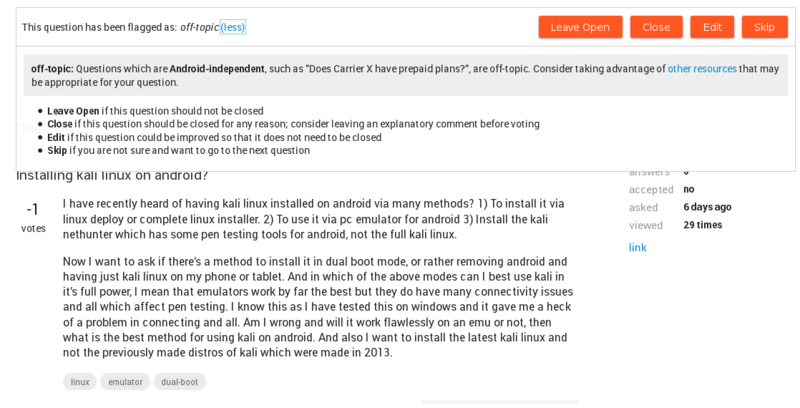 While Android does have it's own implementation of tar [may depend on stock or custom rom] , the OP is asking about [again] an issue that originates from a source external to Android even though the chroot the binary was compiled in is technically on device. This would also be OT because the issue is more likely the tar source code, as well as this would be a development question. I know some of that sounds like nit-picking but that is what it is. You walk on some tricky hybrid ground every now and then. We discriminate 3rd party apps because of the high likelyhood that the issue with those apps originates from the app developer's end and because there are sites that are better geared for that kind of support/shop. Question---> bang out the issue ---> Answer.